Live Near Chicago (Huntley) Illinois? Join us! PLEASE LEAVE COMMENTS FOR YOUR FAMILY AND FRIENDS BELOW IN THE “COMMENTS” BOX. I READ THEM EACH DAY TO THE PILGRIMS ON THE BUS! I started my day early with a 3.5 mile run along the shore of Galilee as the sun began to rise. You can see the map, pictures and videos here. Our pilgrimage day can be seen in two videos below: ONE VIDEO of our day visiting holy, biblical and historical sites, and the SECOND VIDEO of our marvelous dinner at Aberge Shulamit in Rosh Pina. We had Mass at the Mount of Beatitudes. Fr. Tom gave a wonderful homily (again) and it was a delight hearing the proclamation of the Gospel from the top of the Mount of Beatitudes overlooking the Sea of Galilee where Jesus taught the Sermon on the Mount. We then scrambled up the rock and took a lot of pictures and answered a lot of questions. Then to lunch at the Druze Restaurant (see the video). We then drove through the Golan Heights and returned to the hotel — due to the rain — and Fr. Shane gave his daily “Reflections on the Sites Visited.” People had time for a nap, a walk, or just to sit by the Sea of Galilee and read the Gospels. The second video is below. Then we went to an elegant dinner which you will see below in the second video. I tried to make sure that all the pilgrims made it into this video for family and friends back home. The restaurant is Aberge Shulamit in Rosh Pina Israel north of the Sea of Galilee. A great time was had by all and a good Comedy Club on the bus on the return trip! 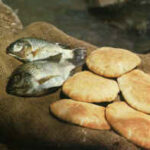 Goofey Homily on Multiplication of Loaves? UPDATE: Based on the comments below and the on my Facebook account (facebook.com/JerusalemJones) a lot of people heard this goofey homily — are are doing something about it!. Check out Jimmy Akin’s brilliant new blog on this. My book Crossing the Tiber deals with this and the Eucharist in detail. Click here.